Wylie, the worm, always frowned. He never smiled. All the other worms were happy and had huge grins on their faces. One sunny morning the worms were outside wriggling about on the ground. "That sunshine feels wonderful," Wendy said. "There’s nothing like a blue sky to make you feel happy," Willie said. "Look at the flowers. Aren’t they beautiful?" Walter added. Wylie looked at the blue sky and the flowers. He thought they were beautiful, but he still didn’t smile. "Wylie, why do you always frown? Why aren’t you happy like the rest of us?" Wendy asked. Wylie hung his head low and inched away from Wendy without answering her question. "I’ve got a good idea. Let’s try to get Wylie to laugh. He’s always frowning! I know there’s something that will make him happy," Willie suggested. "That’s a good idea. Why don’t you go first? You try to make Wylie laugh," Walter said. Willie found Wylie sulking near a pebble. He called, "Look, Wylie. Watch me!" Willie picked up three roly-poly bugs and started to juggle them. All the other worms thought it was great. They started to laugh and clap, but Wylie didn’t think it was very funny and inched away. "That didn’t work very well," Willie said to Wendy and Walter. "I’ll try," Wendy said. She found Wylie hiding under a daffodil’s trumpet. She picked the flower and put it on her head and started to dance around. "Look at me, Wylie. Don’t you think I look funny?" All the other worms thought Wendy looked funny. They clapped and laughed, but Wylie didn’t think it was funny and inched away. "That didn’t work either," Walter said. "It’s my turn now. I think I can get Wylie to smile." He found Wylie near an anthill. "I’ve got a great idea." Walter picked up ten ants and put them on his head. He did a little dance. All the ants fell off into the dirt. The other worms started to laugh. So did the ants. "Hey, Wylie, that was funny. Why aren’t you laughing?" Walter asked. Wylie didn’t think it was funny and inched away. One of the younger worms, Wanda, came over to Wendy. "I know how to cheer Wylie up. See how we are all brown and boring? I’ll bet if we painted ourselves bright colors, it would cheer him up." "That’s a great idea, Wanda. Let’s do it," Walter said. 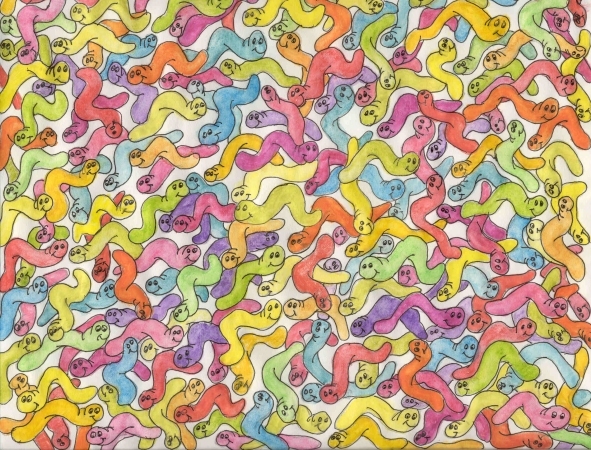 He gathered all the worms around and they painted themselves yellow, green, red, purple, and blue. "Wow! We look great. That’s very funny." "Wylie! Wylie! Come and see what we’ve done," Wanda called. Wylie didn’t think it was very funny. He didn’t laugh. "I can’t believe you aren’t laughing. I think we should paint you orange!" Willie and Walter grabbed Wylie and painted him orange. The paintbrush started to tickle Wylie. He started to giggle. "Stop that," he said. They painted him again. "Stop that. It tickles. Hee, hee, hee." Wylie started to laugh. He laughed so hard and so loud that all the other worms came over to see. "Wylie? Is that you laughing? "I can’t believe Wylie is laughing!" Wylie laughed, and laughed, and laughed. He inched over to the pond and looked at his and the other’s reflections in the water. He rolled around on the ground laughing. "Finally, we got Wylie to laugh." "Does that mean we have to stay this way, all painted up with orange, yellow, green, blue, and red paint?" Wendy asked. "If that keeps Wylie happy, then YES!" Willie said. From then on whenever Wylie looked at his reflection in the pond, or saw the other worms, he started to laugh. He was happy and so was everyone else.